Gifiti, that Magical Garifuna Beverage. Last night I was at the boardwalk in La Ceiba for a special occasion. Moises Canelo, one of the leading Honduran singers was to perform for a private audience. The night was perfect: cool, with a pleasant breeze coming off the Caribbean Sea. While we waited for Moises, the we listened to a repertoire of the late Guillermo Anderson songs, most about daily life in La Ceiba. The event was part of the program for the annual congress that ANDI organizes. ANDI stands for Asociacion Nacional de Industriales. That would be National Association of Industrial Entrepreneurs. It was their first congress in La Ceiba and the city was bent on making a big, positive impression. As part of the event, different local restaurants offered a sampling of their specialties. Being in La Ceiba, of course there was also a presence of small local producers of chocolate and gifiti. We all know chocolate, but few of us have ever heard about gifiti. Was is this thing? 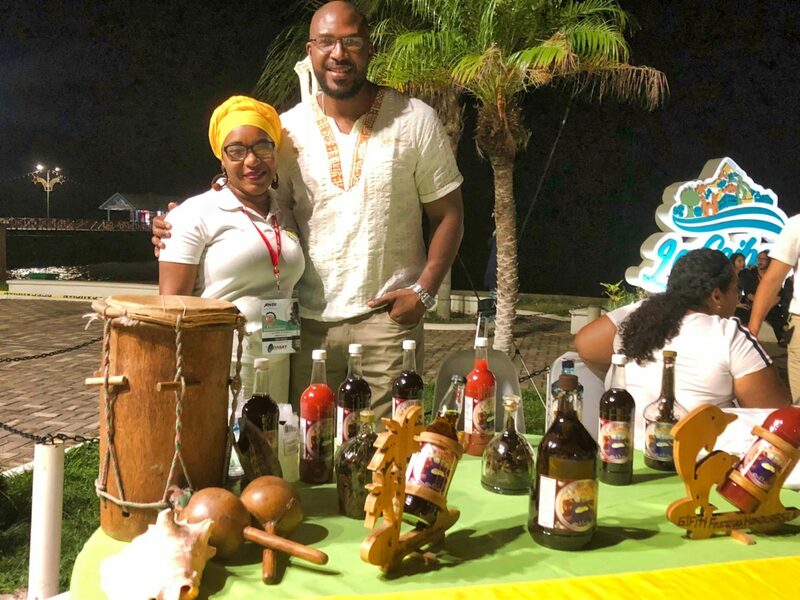 I had the opportunity to chat with Mr. Ivan Franzua and his local rep, Glenda Alvarez about this “magical” concoction that is an integral part of the Garifuna culture. Both are members of Garifuna Community, and Mr. Franzua is an entrepreneur that is producing gifiti. Gifiti is a mixture of herbs and roots that are put in a bottle and then filled in with an alcoholic beverage. The beverage is usually “aguardiente” or a basic rum. But you can pour in good quality room. Mr. Franzua told me he likes to drink his with Tequila! Gifiti is a semi sacred beverage that the Garifuna people use for several purposes. Reputedly, it has a medicinal effect on both body and soul. Many believe it has aphrodisiac properties as well. Gifiti has many different herbs and roots. According to Ivan Franzua, the proper basic ingredients for guifiti must include 7 ingredients. These are chamomile, cloves, anise, pericon, allspice and man stick, (In Spanish, “Palo de Hombre) among others. Different productions include up to 37 other ingredients. Of course, these ingredients are all part of secret recipe that no one will share with you. The beverage is quite bitter. As a matter of fact, gifiti means bitter in Garifuna language. Mr.Franzua markets his gifiti as Gifiti Franzua. He was very candid and told me the story about going to Trujillo with his first batch of gifiti. His objective was to meet with the elder Garifuna men and get their “blessing” and approval for his mix of gifiti. If the Garifuna leaders did not approve it, he could run into opposition and criticism from within the culture. Fortunately for Ivan Franzua, they all loved his concoction and gave it a thumbs up. He currently sells his guifiti in Tegucigalpa in souvenir shops and a few other locations. Where Can You Find Gifiti? His local rep in La Ceiba, a delightful Garifuna lady, whose name is Glenda Alvarez has her office on 12 Calle. If you are in a cab, just tell the driver that you want to go “Donde Lulo”. This is a restaurant that is no longer in operation but that everyone in town knows. You can buy your own gifiti here. You will probably also find it in the better souvenir stores in La Ceiba. In addition to Gifiti Franzua, you can visit several other establishments in La Ceiba and enjoy a good shot of gifiti. The best are Chamorro Restaurant in Corozal and at Gorcha Collins bar in the Zona Viva in La Ceiba. This last establishment is owned by an ex soccer player that is very popular in town. I suggest that you try a shot of gifiti when you are in the north coast of Honduras. Who knows, perhaps it will cure your body and soul! It certainly is worth the effort! Cheers!